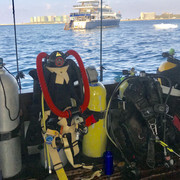 Just returned from an Aggressor live aboard in the Maldives. It was the first double hose regulator seen on this boat. I don't know if any other Krakens have been dived there, but the crew was interested in mine. Once we got beyond the "no not a rebreather", a simple explanation of the two stages in the box "here" with air coming through this hose and out the other hose to the box seemed to satisfy. "But why, what is so great about that thing?" The no bubbles in your face of bubbling next to your ears got some response, but the best was the idea of the "cool" factor. That they all agreed. 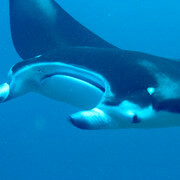 The Maldives are noted for their abundance of Manta Rays, warm (86 degree F) water, wall-to-wall sunshine and flat seas. Great trip.